This is Part 1 in a four-part article. In the age-old conflict between parts departments and service organizations, one concept that never fails to spark debate is the issue of order fill and how best to reduce technician wait times. The assumption is that any reduction in this wasted time will result in increased production capacity. The four techniques or procedures described in Sections II. – V. below (and in later newsletters) illustrate various approaches to addressing this issue. After reviewing these suggestions, it may well be that a combination of the procedures will work better in a specific environment. The goal is to stimulate creative thought and generate the best solution for a given situation. One logical alternative to the technician’s parts counter, or “the back counter” as it is commonly referred to, is an in-shop parts person. What exactly is an in-shop parts person? In addition, who would pay for this individual? We will answer these questions in this section and explain how to implement the in-shop parts runner. The idea of an in-shop parts person is not new. It has been around since dealership service departments have grown to a point where alternatives to improve production are needed. One example of this would be when an increase in production is needed but the building does not allow the addition of technicians due to the fact that the shop is filled to capacity. 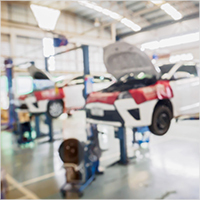 Another situation that might require an in-shop parts runner would be when a dealership adds a service facility in another location within the property but not attached to same building. It is not always practical to invest in another inventory of parts and another staff to run it. Another factor could be that the structure of the parts department technician counter does not allow the larger number of technicians that the dealership now has to be served, even with the addition of parts personnel. The technicians parts counter often becomes a meeting place to discuss yesterday’s race or a place where technicians can gather to share their woes. Anything that will eliminate the lost time at the parts counter will enhance production and certainly serve to improve morale by not encouraging the technicians to gather around and socialize. While you may not realize it, several stores actually encourage the technicians to spend time at the parts counter by putting bar stools at the counter or placing vending machines next to the counter. Some stores have even had magazines stacked on the parts counter for technicians to read while they are at the counter. ATTEMPTS TO IMPLEMENT an in-shop parts person often fail. One reason is that this individual is often referred to as a parts runner or picker. Consequently, the person who is placed in this job is not viewed as a parts counterperson but as a “gopher,” which is often the case. This individual often becomes a janitor or a driver to pick up parts when needed. So often when you need this person they are not around or available. The technicians do not bother to use the runner but proceed directly to the parts counter, which defeats the entire purpose. Another reason for failure of this technique is the caliber of person hired to do the job. The objective should be to “grow your own” parts person. When hiring for this position, plan to move this person into the parts department to become a full-time counterperson. Another option would be to use an experienced counterperson to fill this position. Many people would say that this would be a waste of money to have a higher priced individual in this position. However, if you look at this with an open mind you may find that there are some benefits to having an experienced individual in the shop. If the in-shop parts person is experienced, they will allow for greater increases in production, and the more service you sell the more parts you sell. If an experienced person is used in the shop, they can go to the parts department and pull several parts by themselves in the same amount of time that an inexperienced individual would have to wait just to get waited on. Another benefit to using an experienced individual as an in-shop parts person is that this person will usually be a little older and more mature. The more experienced individual may not spend as much time loitering or socializing with the technicians. A younger, less experienced person can be difficult for the parts manager to supervise when they are out in the shop away from the parts department. Budget and the available labor pool in your area will dictate what type of individual you place in this position. LIKE ANYTHING THAT is done in the fixed operations of a dealership, a budget should be established before implementation of an operating technique such as an in-shop parts person. The type of individual that you put in this position will dictate the budget to some extent. A thorough review of appropriate compensation for an in-shop parts person should include not only an incentive for parts sales but also a component tied to shop performance. This could be an established figure for each flat rate billed or a formula for performance versus production objectives. It could also be tied into CSI. The most important item is that it must have definitive parameters that can be measured. A portion of the in-shop parts person/picker could be paid by the service department. This can be a viable solution if the budget in parts does not allow for additional personnel. Consider that if you were to move an existing parts person into the in-shop parts person position, you would not add any additional expense. However, you have to have enough people in place to allow for continued service at the technician’s counter. Moving an existing person out into the shop will obviously lessen the congestion at the technician’s counter, so it may be a viable alternative to adding the expense of additional personnel. OPERATING SUPPORT THAT is needed for this position will depend largely on the type of individual you put in this position. Catalogs and/or microfiche and readers could be placed in a centralized area for the experienced parts person. Then the in-shop parts person could actually look some parts up before they proceed to the parts department. This not only expedites the parts process but also does not tie-up a computer in the parts department that is already in use. It is also beneficial to have a parts cabinet in the same location as the catalogs. The cabinet could be stocked with high usage parts such as popular filters, recall parts and spark plugs, to name a few. Basically, any fast-moving part could be stocked in the cabinet. Two-way radios could be used to remain in contact with the in-shop parts person—communication will play a major factor in the success of this or almost any other program. If the role of the in-shop parts person will be more toward the runner/picker position, the addition of this person could possibly require that you add intercoms in the shop. The technicians could then call the parts department and have the needed parts delivered to their bay. However, the runner/picker should be dedicated to the service department. Inventory recording and a bill out process of parts used by the in-shop parts person are critical to the success of this program. An easy way to account for the parts used is to have the in-shop parts person fill out a pre-printed parts requisition form whenever they hand out a part. The form should contain information such as quantity, part number, repair order number and technician. This is not all-inclusive of the information that may be needed on the form—customize it to meet your particular needs. TWO ADDITIONAL SIDE benefits to having an in-shop parts person are a reduction in the number of people at the technician’s counter. This means that there will be less noise and less chance that an inappropriate comment or joke will be overheard by one of the dealership’s customers. TECHNICIANS SHOULD ONLY go to the parts counter for exceptions, e.g., a large transmission re-build or a complicated electrical problem. It should be enforced that the technicians use the in-shop parts person whenever possible. If this rule is not enforced, the concept will fail. Continued next week in Part 2!